In many cases, native communities have to face up to the occupation without their knowing of their ancestral lands. Going from conflicts management, to the integrated management of their resources, or through a totally autonomous management, there are a lot of ways to envisage land settlement. Since I arrived to Quebec more than four years ago for my studies in forestry, I have been interested in the way of life and the traditions of native communities living in forested environment. Thus, the idea to meet andean communities during our journey really naturally came to me during the organization of our trip. 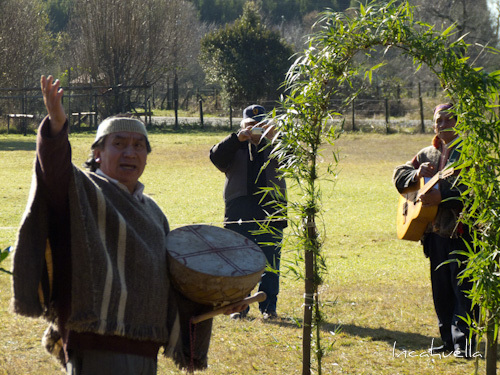 To better understand the situation of andean native communities, I met anthropologists and specialists of some of those. Thanks to these discussions, we decided to look into the fascinating theme of native forestry, meeting with different communities and fieldwork actors, to study more specifically the use and the occupation of their territories. Ie, how are natural resources used and exploited? Does this exploitation remain traditional or did it become industrial? Do communities still manage to reconcile their traditions and their faiths with the control of the state over their territories and natural resources? How do they manage to defend their rights while integrating them more to their recently industrialized country? Can we hope that these communities will become economically autonomous?